New pricing details are available now for Gigajam home users. Before the increase in price to new users comes into effect we are extending our offer to existing registered users for a couple more days whilst the changes are implemented. The new pricing will be live in a few days, so we are keeping our offer to existing registered users open for a couple of further days. The offer is a Lifetime Membership at just £39.99! The new Lifetime Membership will be £79 single one off fee per instrument. We’re going to be changing our subscription and membership pricing for new customers this spring. The good news, to thank existing customers for their support, is that your prices are fixed forever if you maintain your ongoing subscription. If you aren’t already a subscriber then good news for you too, in that we’re keeping our current £39.99 lifetime offer open until midnight Monday. So until then for a £39.99 one off payment you can have access to all 144 lessons, tutor support, video uploads, MIDI uploads, the whole kit and kaboodle. For. Ever. Simply visit http://gigajamonline.com/lifetime to catch this price while you can. Have you ever wanted to learn to play a musical instrument? What better way to kick- start the new year than acquiring a new skill. 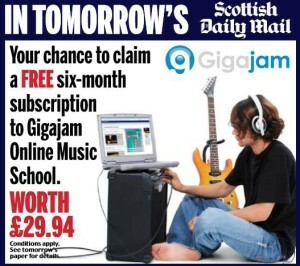 We are giving you the chance to do just that with this fantastic offer for Gigajam Online Music School exclusively through the Scottish Daily Mail this Friday (15th January 2016). 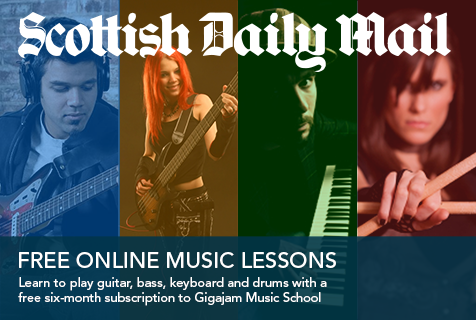 You can learn to play the guitar, bass, keyboard and drums – it’s your choice – and as an added incentive we are giving you the chance to claim an amazing six month subscription free, saving you £29.94. Gigajam’s award-winning interactive lessons get you playing from the first lesson. Videos, play-along files and online assessment guide you from Debut Grade to Grade 5. You can even take nationally recognised graded exams using the Gigajam lessons and examinations, as they are accredited by the University of West London/London College of Music Examinations. Step-by-step instructions ensure that you have everything you need to progress your learning at the fastest possible rate. Every lesson also has a TV show, where tutor and presenter go through the whole of the lesson in a studio format. There is a backing band track for every exercise. So you are not just sitting there playing by yourself, you are always putting into practice the things that you have just read about, listened to and seen. To claim your FREE SUBSCRIPTION simply BUY your copy of The Scottish Daily Mail on Friday 15th January 2016. By registering your name and email address, Gigajam will provide the reader (user) with unlimited access to www.gigajamonline.com free of charge, for six months from January 15th, 2016, until close of business June 15th, 2016. No payment details are required. On expiry, users can choose whether they wish to subscribe for a further period of their own choosing. Gigajam will not share user details with third parties. 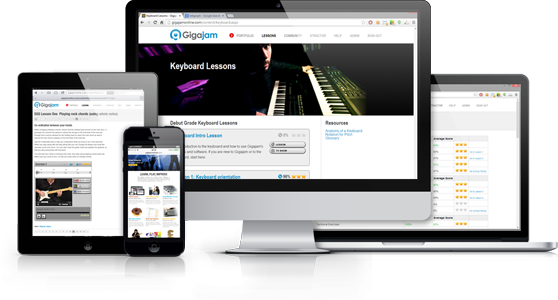 Gigajam Online Music School is a web-based service that requires a modern browser and a connection to the internet. Gigajam’s free MIDI software is available to download for compatible Windows and OSX computers. Melior is a fully inclusive Academy with a creative ethos. Based in Scunthorpe North Lincolnshire, Melior’s Music department has achieved the highest results in the school, with the previous year 11’s achieving 100% A-C’s. Gigajam has been used at the Academy as part of the music departments curriculum offer and extended activities since September 2011. As part of our continued series focusing on how our education clients use Gigajam, Daniel Ray, Deputy Learning Leader of Creative Arts, tells us about his experience. Although Melior’s Music department was already a strength in the school, with almost 50% of pupils accessing Pupil Premium funding, the school needed a way to deliver one-to-one style instrument tuition, without the price tag. How did you implement Gigajam? Initially we implemented Gigajam into a small class of year 8’s, moving slowly to all classes in all years 7, 8 and 9 over each half term as staff became more confident in delivery. This then allowed us to fully measure the impact of Gigajam and make a decision on which year group it was most effective. We now have Gigajam firmly set in our year 9 curriculum as a preparation year to KS4 courses. What specifically attracted you to Gigajam as a solution? Progress in Music is always difficult to monitor in KS3- Gigajams main attraction was the constant feedback element, which was then logged on an online portfolio. Like most new initiatives, it can be daunting at first and is always easier to do what you always have done. However, after delivering the first few lessons it soon became evident that his wasn’t going to difficult to implement, and within the first term our 3 staff in the department were using it. Pupils now opting for Music at KS4 now have a deeper understanding of scores, how parts work together as an ensemble, as well as having a basic repertoire that we have used to submit as coursework. Overall our pupils have responded very well to Gigajam. This is especially so with boys who love the competitive element of getting constant score feedback. Many pupils even try to beat my scores! Although we still deliver other units within our curriculum, whenever we teach Gigajam it always reminds our department that we as teachers should be working less than the pupils! Gigajam definitely puts the ownership of learning onto the pupil, with the teacher taking a facilitator role. At the moment, Gigajam works very well within our year 9 preparation year for KS4 courses. However, it is always at hand should any pupils need a specific intervention within KS4- it is a great tool for differentiation. Having that one pupil that has been tough to engage fully engrossed in independent learning, and asking if they can come back to work after school- this unexpected result happens each year with at least one pupil! Gigajam has been invited to run two workshops at the Bucks ICT Conference on the 28th June 2012 at Green Park, Aston Clinton. 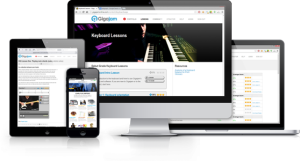 Gigajam Online Music School is available freely to all schools in Buckinghamshire via the Bucks Grid for Learning. All teachers and students can login at www.bucksgfl.org.uk or go straight to http://gigajamprem.bucksgfl.org.uk from school and at home and learn to play guitar, bass, keyboard and drums. The first part of the workshop will cover how the Online Music School works and how schools and students can access and interact with the lessons, software and resources. Videos of Gigajam in action will be presented to demonstrate the wide and varied use being made in schools across the UK. The second part will be a hands on demonstration of the latest version of Gigajam VLE, which includes an e-Portfolio that automatically scores and stores students’ performances, as well as provide house points and the automatic production of lesson completion certificates. Teachers are also able to view and comment on students’ progress.